Here at Shiny Shiny we like to chew the fat and reflect on the past. Of course, by past we don’t actually mean The Past – like, before television was invented, but the digital past – 2007. When Twitter was barely a thing and Facebook was largely students and iPhone had only been in shops for a couple of months. Regrettably it requires a joystick to play properly and it won’t be challenging Uncharted 2 for game awards any time soon. Complete with retro styling, this is probably the strongest pitch to the hip geek market that I have seen the Tories make., though admittedly it’s light on policy details. The game was part of a social media push the parties made back when it look liked Gordon was going to call a snap election in 2007, but I regret to say they haven’t developed the idea this election, relying more on Twitter and er Facebook groups to get their message across. I guess that is the key difference between now and 2007 is that social media has taken off. Back then online strategies were about blogs and email lists. Though I think there will always be a place for silly games in political campaigns. 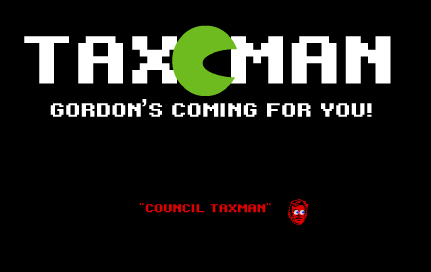 So the Torys have Taxman Gordon, what games should the other political parties make? Lib Dem – well this wouldn’t actually help inform people about their policies but I’d like to see the #nickcleggsfault twitter meme turned into a game. Sort of like tetris, you have to move falling pictures of global disasters so they fall on a picture of Nick Clegg. Labour – probably just a single-person-shooter where David Cameron goes around chasing hoodies, single mums, poor people and gays.